For those of you who don’t know, UNA-USA is a network of passionate volunteers dedicated to working with their local communities and elected officials to inform, inspire, and mobilize Americans to support the principles and vital work of the United Nations. We redesigned our website to not only give our grassroots network even more insider access to the UN, but also to activate potential new members in educating the public on the UN’s vital work. The new website highlights the work UNA-USA members do every day in support of the UN including Chapter activities, advocacy, local Model UN conferences, and events engaging students and young professionals in international affairs. 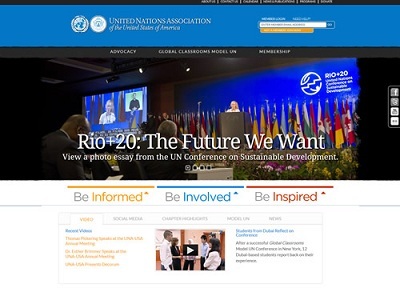 The ease of navigation and added visual elements (such as featured videos), as well as better access to social media outlets makes unausa.org a one-stop shop for visitors to be informed, be involved, and be inspired to support the UN and UN causes. Explore our new features for yourself, and add your voice to the largest network of UN supporters in the U.S. by becoming a member today!